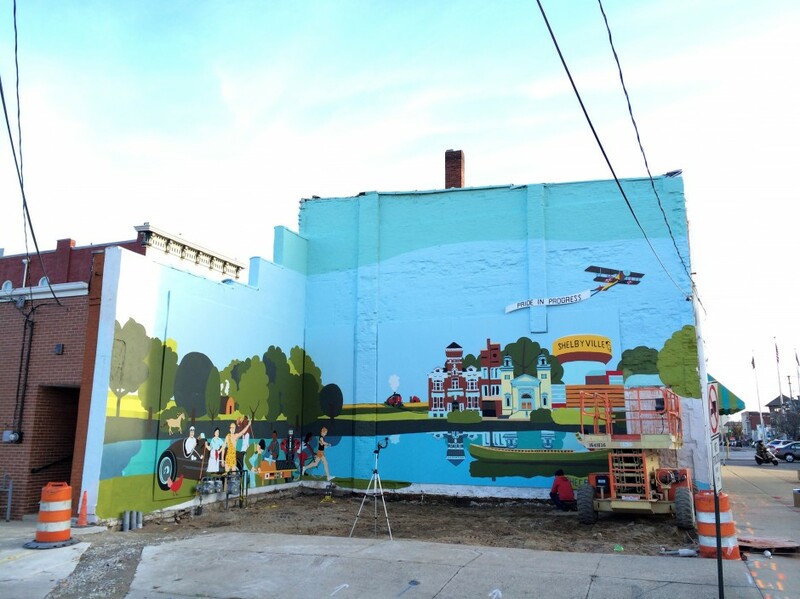 Partnering with Mainstreet Shelbyville and soliciting creative input and painting help from as many Shelbyville, Indiana residents as possible, Big Car designed a mural about the town’s past, present and future in 2014. 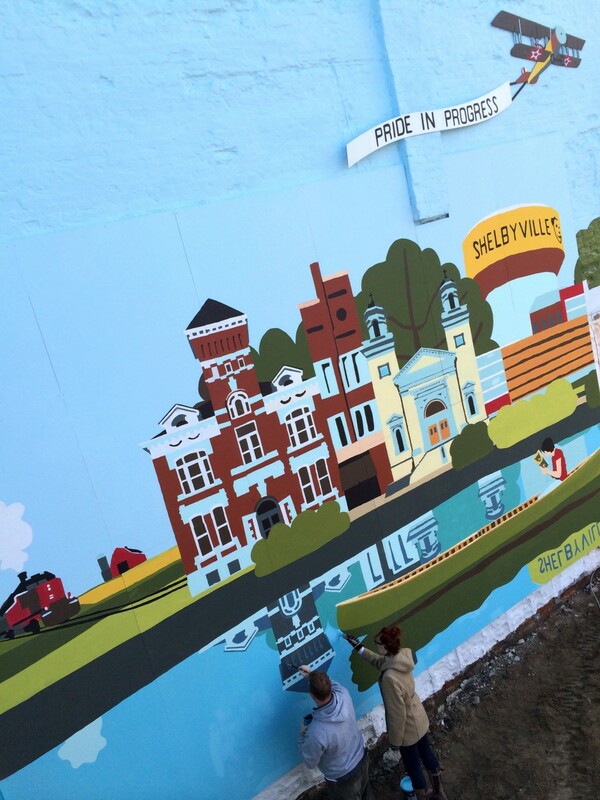 Now installed along the town square, this 70 foot wide by 30 foot tall mural marks a significant achievement in creative placemaking — instantly enhancing the livability of Shelbyville’s downtown while building ongoing community connections. 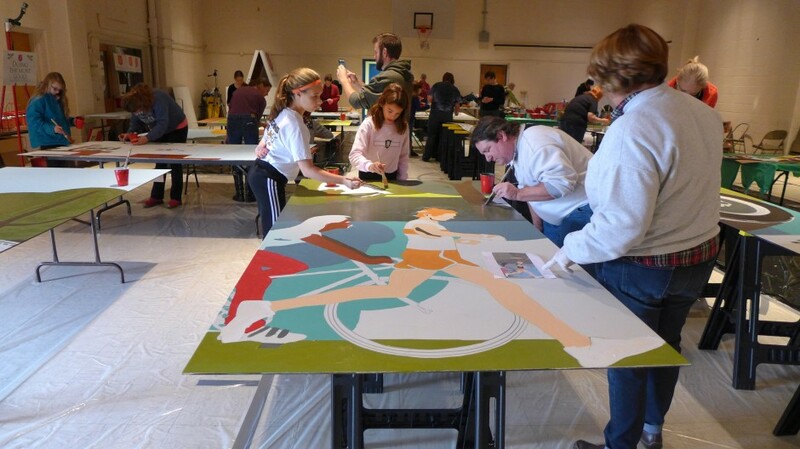 Most of the mural was painted by volunteers from the Shelbyville community — a town 25 miles east of Indianapolis — and Big Car artists in a single day in November of 2014. See lots of photos and video clips here. 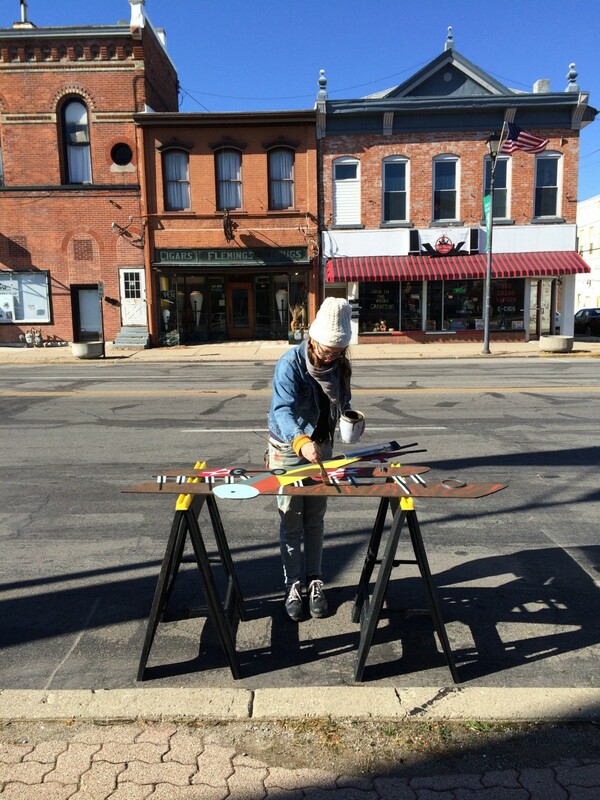 Pride in Progress was designed by Andy Fry in collaboration with the people of Shelbyville and Main Street Shelbyville. The east portion of the mural tells the story of the town’s founding and growth, from left to right, including celebrated Shelbyvillians like Ma Kettle and the early motion picture Tarzan, Big Jim Pierce. 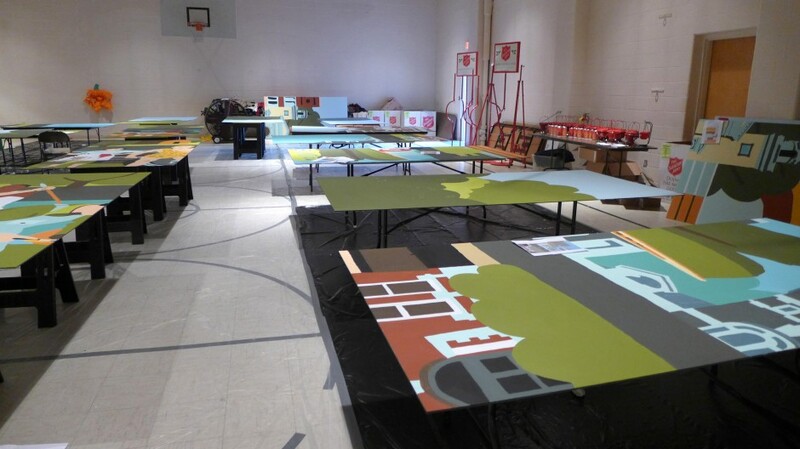 Also included is an depiction of Shelbyville’s manufacturing history in three parts: a furniture maker, a machinist/power tool operator, and ultimately a robotic worker which represents technological changes characterizing the modern assembly line. The procession of people also includes a nod to Shelbyville’s future: a woman rides a bicycle and a man jogs along the Blue River, on a trail that does not yet exist. 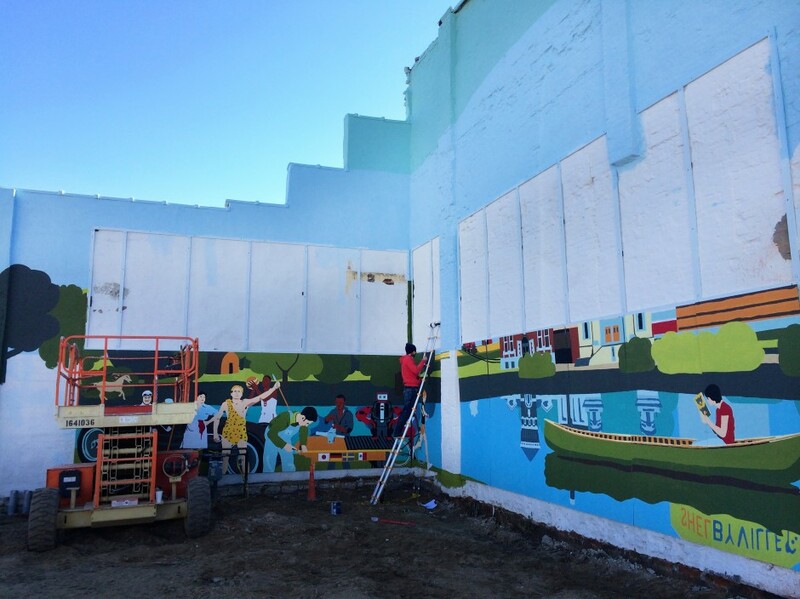 As of this writing, the building (an abandoned barber shop) is still being renovated, and the lot which flanks the mural is just a sand pit. We will keep this post current with the progress as the empty lot transforms into a gathering place – which will reflect the town square’s restoration into a pedestrian-friendly civic center. 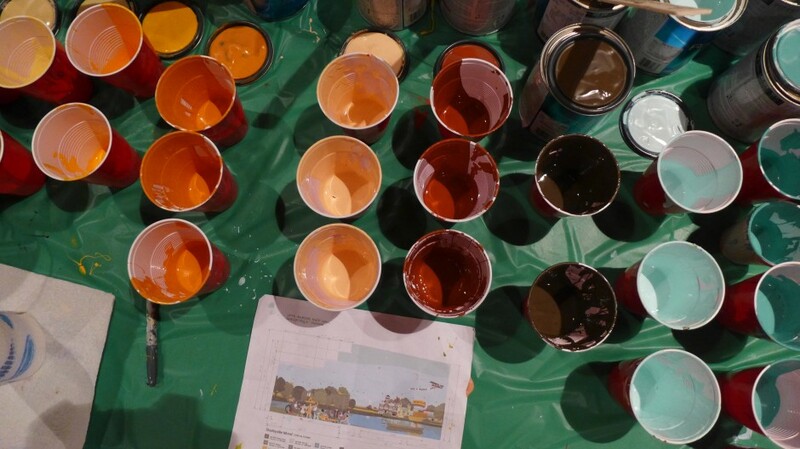 In addition to the help of dozens of volunteers from Shelbyville, this mural was made possible by the following partners: Mainstreet Shelbyville, Blue River Community Foundation, Shelby Arts Alliance, and Shelby Art Guild Association. ©2018 Big Car Collaborative. All Rights Reserved.